Feel free to read the changelog in the dedicated "WinReducer EX-81" website download page ! NEW : Support to integrate automatically Net Framework 4.6 in your ISO (if downloaded using the new "WinReducer EX-81 Updates Catalog v2015.07.1"
To get this build you need to consult the "VIP Closed Beta" page in the "WinReducer.net VIP Member Area"
Feel free to read the changelog in the dedicated WinReducer EX-81website download page ! All language files are back, and I really want to thank all translators for their speed to update the file. So, you will find : Brazilian (by Paulo Neto), Chinese (by Richard Liu and sHAOgE), Deutsch (by KrX), French (by Jpm), Italian (by basex64), Polish (by WinClub.pl) and Russian (by walkman8196). A new translation is also available : Romanian (by ruby2hora) ! There are also several Updates and Bugs Fix. Feel free to read the changelog in the dedicated WinReducer EX-81 website download page ! Feel free to read the changelog in the dedicated WinReducer 8.1 website download page ! "WinReducer 8.1 - v1.5.5.0" is available ! "WinReducer 8.1 Updates Catalog - v2015.03" is available ! Add : March 2105 updates based on "Windows Update"
"WinReducer 8.1 - v1.5.4.0" is available ! "WinReducer 8.1 - v1.5.3.0" is available ! "WinReducer 8.1 - v1.5.2.0" is available ! "WinReducer 8.1 - v1.51" is available ! "WinReducer 8.1 - v1.50" is available ! "WinReducer 8.1 - v1.41" is available ! "WinReducer 8.1 - v1.40" is available ! "WinReducer 8.1 - v1.39" is available ! NEW : "French" language file (v1.32) updated by "Jpm" (WinReducer Forum Member) and win a free "Lifetime VIP Edition" for the complete French translation package ! "WinReducer 8.1 - v1.38" is available ! "WinReducer 8.1 - v1.37" is available ! NEW : "Italian" language file (v1.32) updated by basex64 (WinReducer Forum Member) and win a free "Lifetime VIP Edition" for the complete Italian translation package ! "WinReducer 8.1 - v1.36" is available ! "WinReducer 8.1 - v1.35" is available ! This is a maintenance update which brings many fix for the "WinReducer Updates Downloader" Tool ! "WinReducer 8.1 - v1.34" is available ! This is a maintenance update which fixes some bugs ! "WinReducer 8.1 - v1.33 is available ! This is a maintenance update which improves WinReducer 8.1. "WinReducer 8.1 - v1.32 is available ! This maintenance update brings a new component, updates some others and solve a Update 3 slipstreaming trouble. "WinReducer 8.1 - v1.31 is available ! This is an important maintenance update which solves many WinReducer bugs. So, please update your version to this latest build to ensure you to have the latest changes. "WinReducer 8.1 - v1.30 is available ! This is an important update which solves a bug while using WinReducer for the 1st time and prevent you to extract your ISO. "WinReducer 8.1 - v1.29 is available ! This is an important update which greatly improves removing speed if you try to use "Optimizations - EXPERT - WinSXS Folder Cleanup", and solves many issues ! "WinReducer 8.1 - v1.28 is available ! This update brings HDD/SSD size detection to inform you that you possibly have low free available space. The message is displayed if you have less than 15Gb of free space on your HDD/SSD. It will also improve and fix many WinReducer components. "WinReducer 8.1 - v1.27 is available ! This is a major update which brings "Update 3" support (associated with the "WinReducer Updates Catalog" which will be available tomorrow) and add many information during updates downloading (such as remaining time and download speed !) ... This also includes important bugs fix ! "WinReducer 8.1 - v1.26 is available ! It brings an important bug fix for "System - Integrate - Updates", which prevented a correct integration of x64 Windows Updates under certains circumstances ... Feel free to read the changelog in the dedicated WinReducer 8.1 website download page ! "WinReducer 8.1 - v1.25 is available ! It brings many changes to improve WinReducer 8.1 ... Feel free to read the changelog in the dedicated WinReducer 8.1 website download page ! "WinReducer 8.1 - v1.24" is available ! It brings many changes to improve your WinReducer 8.1 ... Feel free to read the changelog in the dedicated WinReducer 8.1 website download page ! A 2nd important "WinReducer Software" update builds is available ! --> Download them using this page : "SOFTWARE" ! A huge "WinReducer Software" update is available ! * NEW : WinReducer 10.0 has been officially released to reduce your Windows 10 Technical Preview Edition ! --> Download them in this page : "SOFTWARE" ! WinReducer 8.1 - v1.21 is available ! This is an important major maintenance build ! You absolutely need to update WinReducer 8.1 to this version ! Find complete information in the changelog ! WinReducer 8.1 - v1.20 is available ! This is a major maintenance build which solves the Windows "Network and Sharing Center - Change Adapter Settings" missing display bug. It brings new options like : "TOOLS - Bootable USB Device Creator - File System" (to choose between FAT32 or NTFS), "TOOLS - ISO File Creator - Save in an ISO File" (add "USB Transfer To") and improve "APPLY" tab by adding the speed profile you will use during removing (saved in your wccf !) ! It also improves many bug with WinReducer "OPTIONS" like Languages or Themes ! WinReducer 8.1 - v1.19 is available ! This is a major maintenance build which solves the "Windows Explorer ISO Mount" bug, as well as many other improvements ! WinReducer 8.1 - v1.18 is available ! This is a maintenance build which improves the "MOUNT" window with the missing 1st available Windows Edition and add new options to automatically configure the WIM or ISO creation after the removing process (hide the ISO Creation window) and a shutdown computer option ! WinReducer 8.1 - v1.17 is available ! This is a maintenance build which brings support for all ISO with embedded split install.wim (*.swm) files ! * WinReducer 8.1 - v1.16 is available ! This is a minor maintenance build update ! It solves a bug with "Unattended - Hide Wireless Setup - Profile" and add the possibility to use All in One ISOs with up to 30 different possibilities with a new "OPEN - MOUNT" Graphical User Interface ! * WinReducer 8.1 - v1.15 is available ! This is a major maintenance build update ! It includes 2 important fix for the "Send to Desktop" shortcut bug and the "Modern UI Search" bugs. There are also many Cleanup Improvements to reduce even better your WInReduced installed system. * WinReducer 8.1 - v1.14 is available ! * WinReducer 8.1 - v1.13 is available ! This is a major update ! * WinReducer 8.1 - v1.12 is available ! This is a major maintenance build which add, improve or fix many WinReducer Components ! You absolutely need to update to this version if you plan to slipstream Update 1 or integrate drivers in your ISO ! * WinReducer 8.1 - v1.11 is available ! This is a major maintenance build which especially solved a bug with "WinReducer Updates Tools" for x86 "Update 1" ! And add a new procedure for the 1st launch configuration which is much more easier to use. WinReducer will download all necessary software and extract all needed files in the correct folder path. So you don't need any more to search the internet for all required files ! * WinReducer 8.1 - v1.10 is available ! This is a major maintenance build. You absolutely need to update to this new build to ensure the best user experience ! You also need to update the included English language file and the default GUI theme (see the changelog). --> All other categories will be updated in the next weeks. * WinReducer 8.1 - v1.08 is available ! This is a minor maintenance build which solves a bug with "Update 1" integration by providing support for "KB2959977" update. So if you experienced troubles during "Update 1" slipstreamming, you need to update to v1.08 and use the "WinReducer Updates Catalog" v2014.05.1 ! * WinReducer 8.1 - v1.07 is available ! This is a major maintenance build which solves many important bugs and brings many new components or optimizations. You absolutely need to update the English language file to v1.07, and if you plan to use the "WinReducer Update Catalog", you need WinReducer 8.1 - v1.07 minimum ! For more information, please read the "changelog.pdf" file provided in the website or in the zip package. All other categories will be updated in the next weeks. * WinReducer 8.1 - v1.06 is available ! This is a major maintenance build which brings many important bugs fixes. You need to update to this build if you experienced troubles with windows folders rename or "Modern UI - OneDrive". WinReducer has been also upgraded to support a new removing engine which improve speed (by 70%) and a better cleaning. All Components will be updated steps by steps ! EDIT : A bug has been discovered in the language file and prevent launching WinReducer 8.1, so please redownload the package to fix it. Sorry for the inconvenient and thank you for your understanding ! * WinReducer 8.1 - v1.05 is available ! This is a minor maintenance build to support Update 1 integration (It doesn't work with previous build !). To download all Update 1 files, you need to use the "Updates Tool" of WinReducer 8.1, to properly download them and integrate them correctly (Tutorial). This build also add some improvements. * WinReducer 8.1 - v1.04 is available ! This is a major maintenance build which improves WinReducer with a new Modern UI Apps removing process, bring new components to remove and solve bugs. * WinReducer 8.1 - v1.03 is available ! This is a minor maintenance build which improves WinReducer by solving bugs in case you use want to split your wim file. * WinReducer 8.1 - v1.02 is available ! This is a major maintenance build which improves WinReducer by adding many new components or improvements and bugs fixes. It brings support for UEFI Boot on both USB Device and ISO DVD. * WinReducer 8.1 - v1.01 is available ! This is a maintenance build which improves WinReducer by adding some improvements or bugs fixes and new components to remove. * WinReducer 8.1 Forum is available to everyone ! * WinReducer 8.1 - v1.00 (Final) is available ! I'm really proud to announce the release of Final version of WinReducer 8.1. I want to thank all active forum members for all excellent feedbacks and ideas which helped improving WinReducer 8.1. * WinReducer 8.1 - v1.00 (RC2) is available ! This is a major update, so please consider it as an important update by rebuilding your WinReducer folder from scratch ! This RC2 includes many new components to remove and improvements to cleanup or customize your Windows 8.1 system. You could read all changes in the Changelog provided with the zip file. * WinReducer 8.1 - v1.00 (RC2) will be available tomorrow ! * WinReducer 8.1 - v1.00 (RC1) is available ! 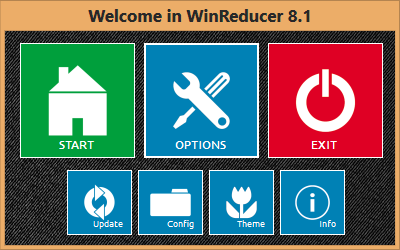 I'm really proud to announce that the 1st Release Candidate of WinReducer 8.1 is available for everyone. This build add only minor bugs have been fixed. Because thank to the excellent work made by WinReducer Forum members, with previous beta version, to report bugs or improving it by sharing ideas; WinReducer 8.1 has reached an important step with a great stability and a user friendly GUI, associated with a huge list of Help Tips to help everyone customizing or reducing Windows 8.1 according to their own needs. * WinReducer 8.1 - v0.99.7 (pre-final) is available ! New Functionalities, many improvements and bugs fixed have been added. All informations are provided in the zip package ! EDIT : If you experienced an error while loading a previous preset, just click on "continue", you will not have this error with all preset created by v0.99.7+. Sorry ! * WinReducer 8.1 - v0.99.6 (pre-final) is available ! You will find in this maintenance build, many improvements and bugs fixed. EDIT : There is a problem with the zip package, so please re-download it and verify the WinReducer build date to be : "2013-12-30 00:48". Sorry for the inconvenience ! * WinReducer 8.1 - v0.99.5 (pre-final) is available ! WinReducer Updates Tool is available with all updates (Dec. 2013) and many links for Drivers (in partnarship with "station-drivers") and Software to help you find many free replacement to all Windows components or drivers you want to replace ! Many new Components (especially Tweaks). An Option to clear your WinReducer Settings in case you want to load or recreate your settings which could be saved in wccf preset file. 2 new "Optimizations - EXPERT" (reserved to experienced users) to completely clean the WinSxS folder, with just keep only necessary folders or files. Read the Help Tips to help you understand all the possible troubles. As usual, you could find the latest informations in the dedicated WinReducer 8.1 Forum thread ! * WinReducer 8.1 - v0.99.4 (pre-final) is available ! New Services to remove and many bugs fixed (Net Framework 3.5 fix included). And WinReducer 8.1 Database has been also updated. And I wish you a Merry Christmas ! * WinReducer 8.1 - v0.99.3 (pre-final) is available ! Bug fix maintenance build to solve Modern UI Users Account Picture and some other minor bugs with Tweaks. * WinReducer 8.1 - v0.99.2 (pre-final) is available ! Bug fix maintenance build to solve mounting troubles when you try to use an ISO in which Net Framework 3.5 has been slipstreamed. * WinReducer 8.1 - v0.99.1 (pre-final) is available ! You could download it in the WinReducer 8.1 Download page ! Just keep in mind that is still a work in progress, so you could experience some troubles or bugs after Windows installation. To avoid them, the best choice is to test your customized ISO in a virtual machine to be sure that everything you need is working ! Reading all included pdf files will help you to use WinReducer 8.1. If you find a bug, you could always add it in the dedicated forum, thank you ! The WinReducer 8.1 zip package includes the English Language file and the default GUI theme ! * WinReducer 8.1 Database Information is available ! You could use it to know which WinReducer Component(s) you need for a specific Windows functionality. It also contains the complete list of all "Automatic Removing" and "Protect" presets, to easily find which WinReducer Components will be removed or protected depending on Components you choose ! You could find the link in the WinReducer 8.1 download page ! * WinReducer 8.1 GUI Themes are available ! To use these GUI Themes, you absolutely need to update WinReducer 8.1 to v0.99.1 otherwise you will experience bugs ! As usual, you could find the latest information and report bugs in the dedicated WinReducer 8.1 Forum thread ! * Pre-Final WinReducer 8.1 - v0.99 is available ! ==> The WinReducer 8.1 zip package includes the English Language file and the default GUI theme ! As usual, you could find the latest informations and report bugs in the dedicated WinReducer 8.1 Forum thread ! * Pre-Final WinReducer 8.1 - v0.99 will be available Monday 2 December 2013 ! I'm really happy to announce that the development of WinReducer 8.1 is close to the end ... So a Pre-Final build will be available in 2 days. You will find many new elements to customize or remove (more than 720 components ! ), many new informations (HowTo and ReadMe pdf files, WinReducer Help Tips for each components), Translations files (coming soon !) and new GUI Themes to apply to WinReducer to improve the appearance. Before trying to use WinReducer 8.1, I really encourage you to read the "HowTo.pdf" file, which will be provided in the zip package, to be sure to correctly start using it ! * New WinReducer 8.1 screenshot ! And as usual, you could find the latest and many interesting informations in the dedicated WinReducer 8.1 Forum thread ! * WinReducer 8.1 new GUI design screenshots are available ! You could find them in the forum by following this link : WinReducer 8.1 screenshots !